eBook, provided for review from NetGalley in exchange for an honest review. Here is the Synopsis off of goodreads “Peter Stewart grew up on a unique version of the Arthurian legends taught him by his father, a harebrained quantum physicist who asserts that anything is possible. But Peter disbelieves anything which cannot be scientifically explained, despite a nagging sense that there is more to the world than meets the eye. As soon as I read “unique version of Arthurian Legends” I knew I had to read this book. I love anything that involves Arthurian Legend. And I am super glad that I requested this book and got it. I recommend this book to anyone who like Arthurian Legend, retellings, and awesome fantasy novels.. this is for you. Peter is a geeky kid.. and science nerd. Peter does a twist on an experiment, something all his own and it gets him in to trouble. While Peter is high school age his classes are beneath him, the Headmaster wants him moved to the University where his father is a Professor. Lily sees things that no one else can see. After her and Peter’s first meeting, she can tell there is something different about him. The novel really picks up, and takes you on a wild ride with an epic prophecy, taking magic and science rooted in the real world, and using centuries old Arthurian Legend to create the first book in a wonderful new series. The science was not difficult to understand, and the writing was well done. I loved Lily. I can’t wait to see where this series goes with the next book. If you’re interested, you should definitely head on over to CA Gray’s website.. There is a very interesting Q&A with her. 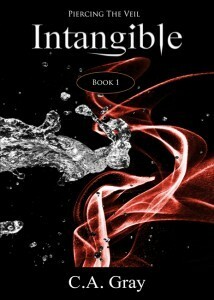 She said it took her 3 years to write Intangible, because of all the research and plotting out the novel. I believe it was really well done. This entry was posted in Book Reviews and tagged 4 stars, arthurian legend, books, ebook, lovely writing, netgalley, review, trilogy. Bookmark the permalink.